It’s a fact. Venice can be wet. 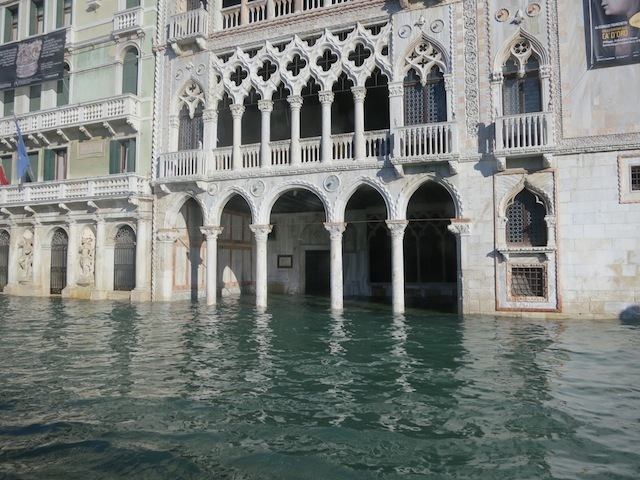 Aqua Alta, or High Water, as it’s called, can be a true Venetian adventure, but at some point you’ll want to stay dry. 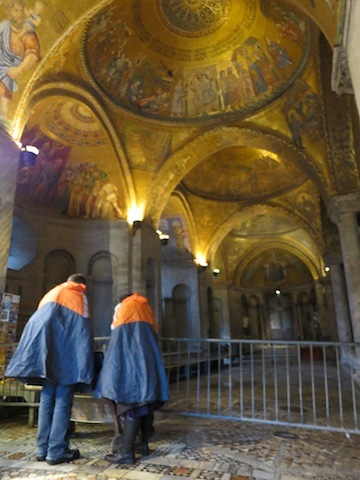 Yes, yes, you can go to the Duomo in St Mark’s Square or the Doge’s Palace like everyone else … or you can branch out. 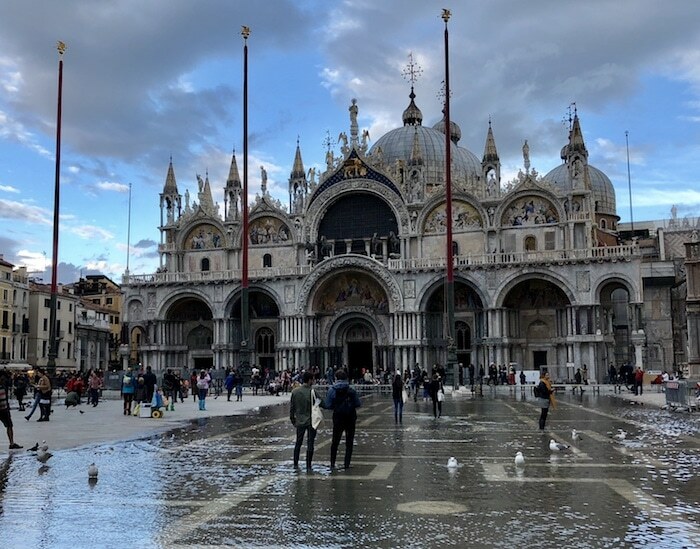 So here are some tips on what to do in Venice when it rains. And, just as importantly, what not to do. If it’s raining in the evening, go to the opera. 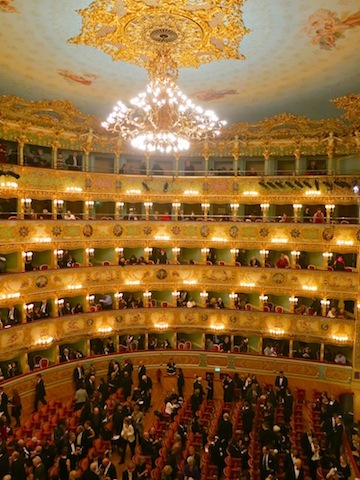 The renowned La Fenice Opera House is worth seeing for its over-the-top 19th century-esque architecture alone. Think pale green, gilt and red velvet. Not only can you experience some world famous opera, you can savour Venetian luxury living at its best. Warning: fashion rules. You’ll be brushing shoulders with tuxes, jewels and furs, so dress your best. And don’t mind that La Fenice is not as old as it looks, or that it has burned down and been rebuilt more than once. It’s still glorious, because La Fenice, which means The Phoenix in Italian, rises from the ashes every time. Don’t be scared of the high prices online. Tickets can run hundreds of dollars. However, Mark and I got seats for 30 Euros (about $45) on the day of the performance by going to the theatre in the morning and buying last minute tickets. Be careful of ‘B’ seats. When we found our upper level box seats I was shocked to find I couldn’t see the stage, not even one little glimpse! The seats are not tiered like at other places, so try to be at the front (they’re only two deep so you have a 50-50 chance). Learn from my mistake and look at the seating plan carefully when the clerk shows it to you when buying your tickets. Fortunately for me, three elderly Italian men had a spare seat and let me move up. My husband Mark was left to fend for himself, but love doesn’t always mean sacrifice and besides, he’s tall and could see at least a third of the stage. If you can’t decide what to do in Venice when it rains during the daytime, think culture. Venice is so rich in art it would be a shame not to see some of it. 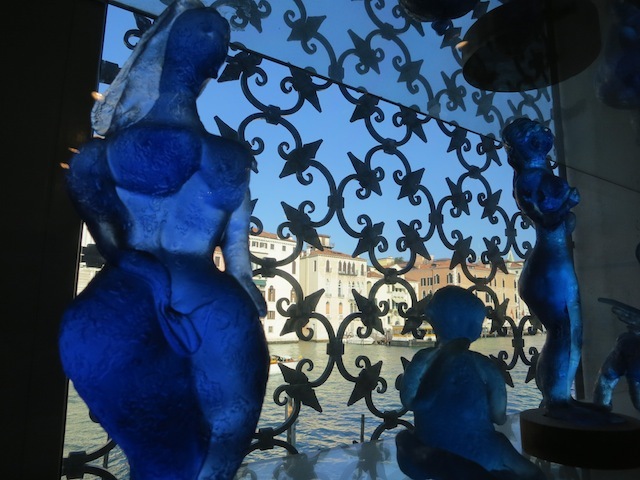 Peggy Guggenheim’s former home (and burial site), the Palazzo Venier dei Leoni, overlooks the Grand Canal and is a good way to view top rate modern art and satisfy your curiosity about how the other half once lived at the same time. 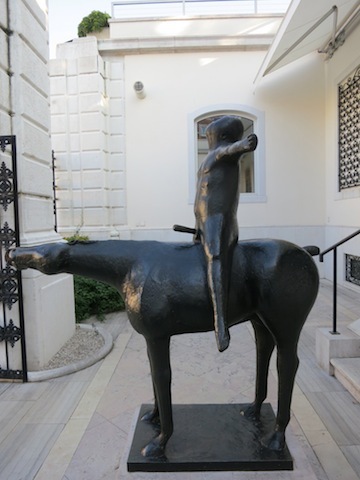 Designed to showcase the late heiress’s personal stash of great art, the Peggy Guggenheim Collection has an excellent selection of ‘isms’ – Cubism, Futurism, Surrealism and American Abstract Expressionism. Amidst the masterpieces by Picasso, Duchamp, Kandinsky and Pollack, you’ll find plenty of titles to ponder over. This is modern art after all, and boundaries were being broken. In the running for most outrageous titles are: Woman with Her Throat Cut by Giacometti, Picabia’s Very Rare Picture on Earth and Dali’s Birth of Liquid Desires. 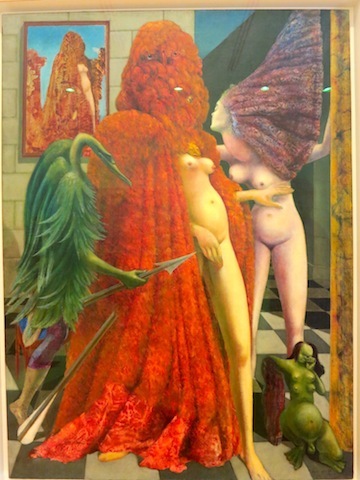 My personal favourite, since I was on my honeymoon, was Max Ernst’s Attirement of the Bride. I hate to criticize, but another thing not to do is eat at the cafe there. My pomodoro sauce tasted as if it came from a can and the pasta was mushy. Even if you’re desperate to stay inside in Venice when it rains, I’d still suggest going elsewhere. 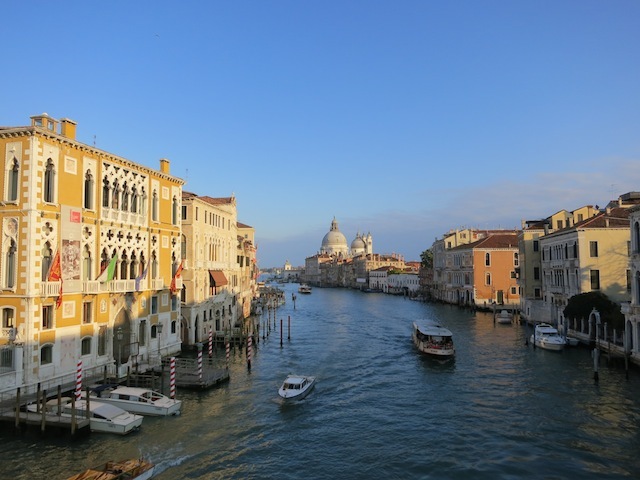 If you thought Peggy Guggenheim had it good, wait until you see how the rich Venetians lived in the 1700s. Also located on the Grand Canal, the stunning Baroque palace, Ca’Rezzonico, is another good way to occupy yourself in Venice when it rains. 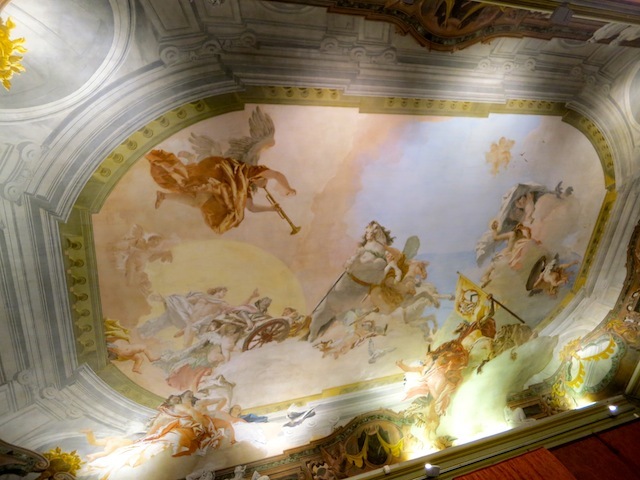 Now the Museum of 18th century Venice, Ca’Rezzonico is a glorious mansion full of Tiepolo ceilings complete with flying cherubs (putti) and revealing paintings by Longhi, who chronicled (and criticized) the ennui of the Venetian upper class. Above all imagine the decadence. The 18th century was a notorious period in Venetian society. Venice’s power was crumbling, but its citizens lived in denial, adopting an over-the-top lifestyle of excess and masked balls. (Not every Venetian, obviously, but this is the lore.) Fifty Shades of Rome burning, anyone? Look at the glorious original Murano glass chandeliers very very carefully. That way, when the sun finally shines, and it will, you can take a vaporetto out to the nearby island of Murano and buy a chandelier for yourself. That’s what Mark and I did. After all, you have to take home some kind of souvenir. The main palazzo, with it’s Venetian Gothic windows and distinctive red tones, dates back to the 14th century and is right on the Grand Canal, just around the corner from St Mark’s Square so it’s very easy to get to. 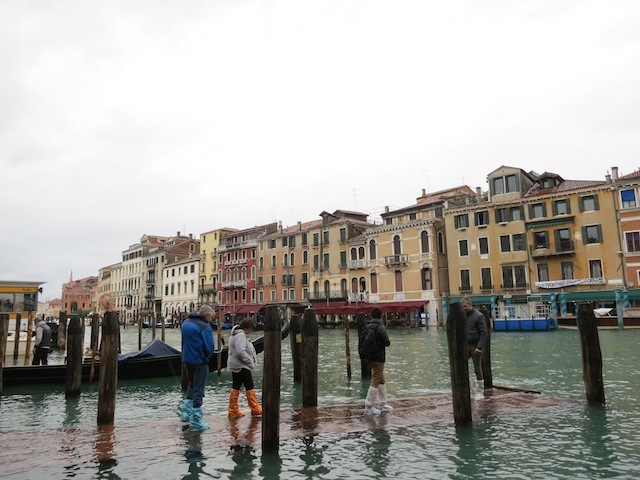 It’s not the cheapest way to have a drink, but it may be the most memorable, and honestly, when it comes to rain and high water in Venice, you need to gather up as many good (and dry) memories as you can. 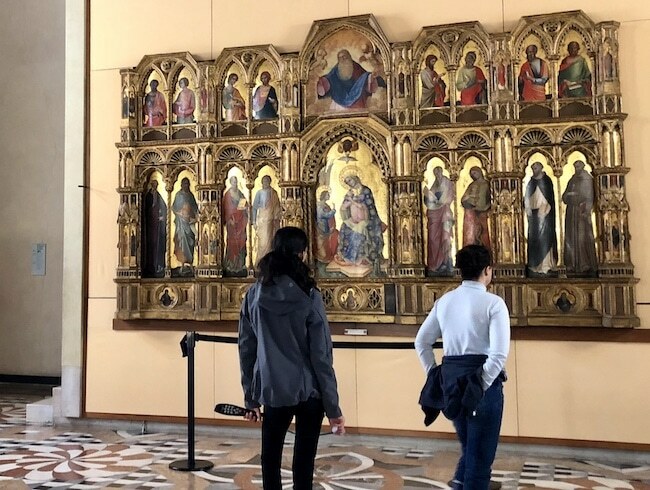 If you’re still wondering what to do in Venice when it rains, and the sky’s not getting any lighter, check out the Accademia Gallery of Venice. Churches are s great way to escape a downpour, but if the rain has settled in for good, somewhere bigger will keep you dry longer. Located in Dorosdouro on the south bank of the Grand Canal this renowned museum is right at the foot of the photo-worthy Accademia Bridge. Inside you’ll find a treasure trove of great Venetian art including work by Bellini, Carpaccio, Tintoretto, Canaletto and Longhi (who I’d never heard of it until I got to Venice, but who also has work in the Gritti Palace Hotel’s Longhi Bar, if you prefer to drink while you escape the bad weather). One of the Accademia’s most famous pieces, however, is Vitruvius Man, the famous drawing by Leonardo da Vinci of a naked man in a circle (and a square) that explores the ‘geometry of perfect proportion. First, don’t be disappointed if you don’t see Vitruvian Man. It’s very fragile and almost never not on display. Trying to figure this out will make you feel not just badly proportioned but thick as a plank, too. So that’s my advice on what to do in Venice when it rains. Above all, put on the boots, the raincoat and enjoy your trip to this fabulous watery city. Thanks GlobalGrasshopper. Rain or shine, Venice needs an escape route. Wow, I would never have guessed that it would be possible to buy tickets for a performance at La Fenice and not see the stage! I would likely have burst into tears – although then it would have made it highly unlikely that three elderly men would come to my rescue.